inspired, dedicated, and awesome individuals. 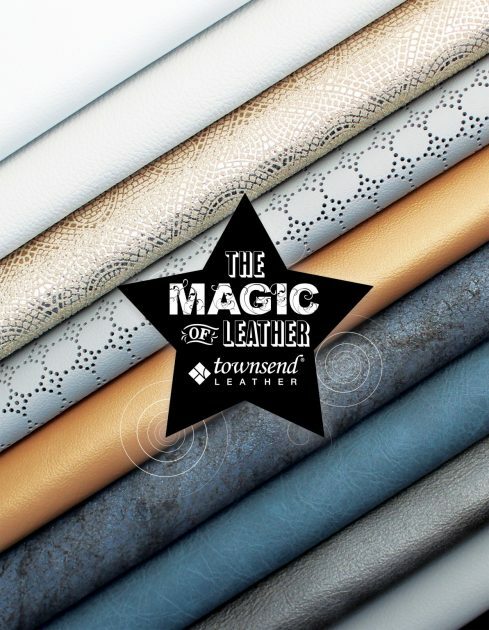 Townsend Leather is a specialty leather manufacturer artistically producing made-to-order leathers for the luxury aircraft and hospitality industry. 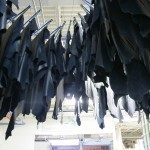 We are a group of empowered partners who produce the most beautiful leather in the world. 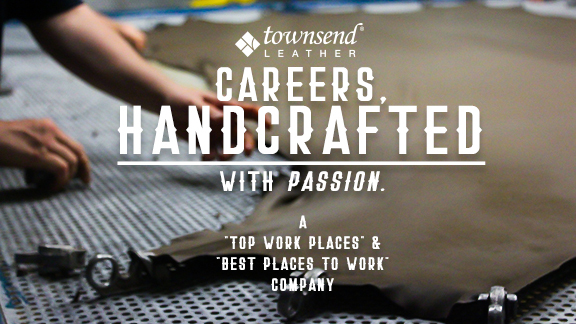 TOP WORK PLACE, TOWNSEND LEATHER, IS HIRING! A job, a change, a career, a passion, a craft, your life. 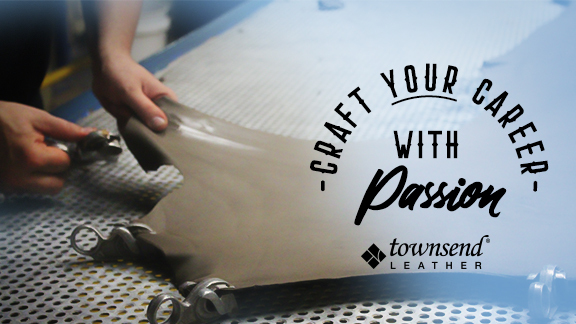 Craft your future, with a passion driven career at Townsend Leather. We love what we do, who we do it for, and who we do it with – join the team. 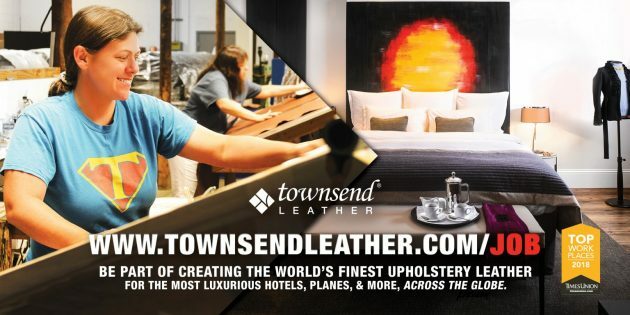 Townsend Leather is an award-winning, awesome, fast-paced, growing local company with a lot to offer. If you’re looking for a rewarding career with plenty of growth and opportunity, we might be a great fit. Our ideal candidates will be organized team players with strong communication skills, who will embrace problem solving, culture, and poses the GRIT to get the job done. Be a problem solving hero who keeps us connected and get involved all over the company. We aim to hire great people and then find the place they fit best. 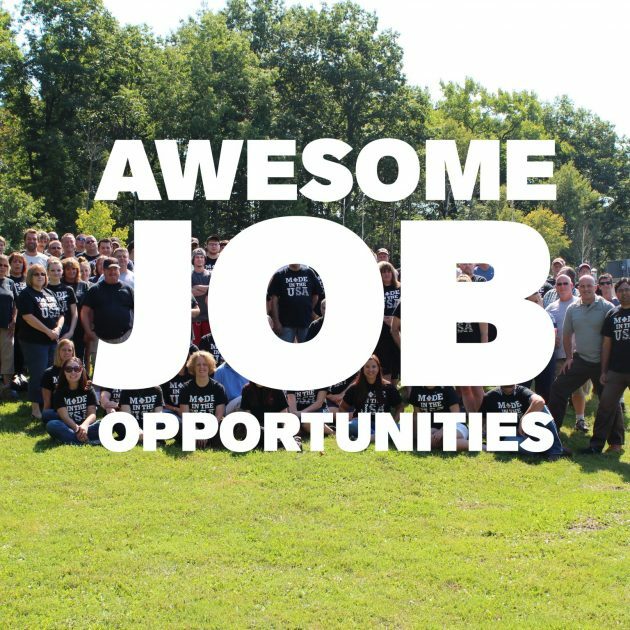 Even if none of our open positions fit your future goals, but you still want to be part of an exciting, culture-forward, passionate, fun-focused team – APPLY, we might find a spot just for you! We are always looking for great people to join our team. We aim to get great people in the door and then over time find the perfect spot to utilize their interests, skills, and passions. 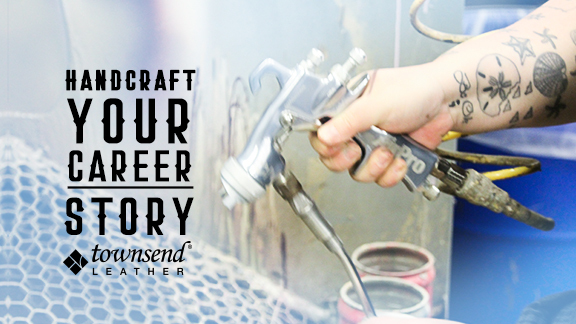 Townsend is built on experience and knowledge and skill. 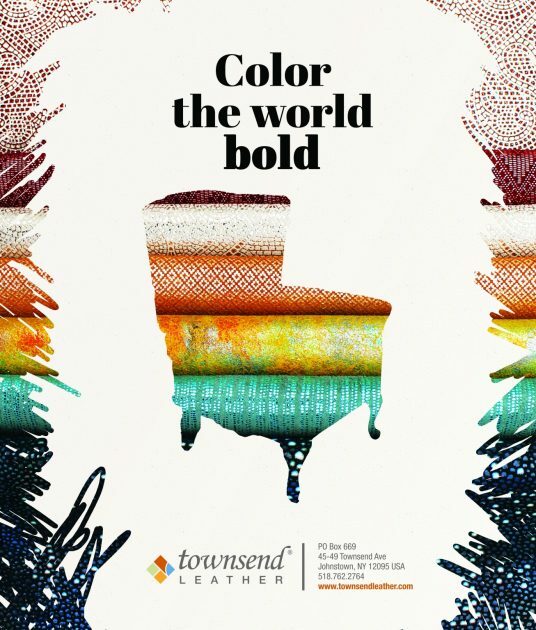 Townsend partners need to be well rounded in their understanding of our people, products, and processes. We hire with a goal of giving our production force opportunity to learn from all parts of the production floor and all pieces of the process. Great candidates for our production team will be willing to learn new things and always continue to learn, will have an above-basic understanding of computers – as all Townsend Partners are required to use a computer, will have a desire to lead from a position that does not have a leadership title, and amongst many other things will be someone people look forward to seeing each day. Townsend Leather, named a Times Union Top Workplace and Albany Business Review Best Workplace is committed to hiring high quality job candidates. Incomplete applications will not be considered. Townsend Leather is a drug and alcohol free company.Pre-employment drug testing and background check is required for all candidates. Our Partner Development Team would love to hear from you. 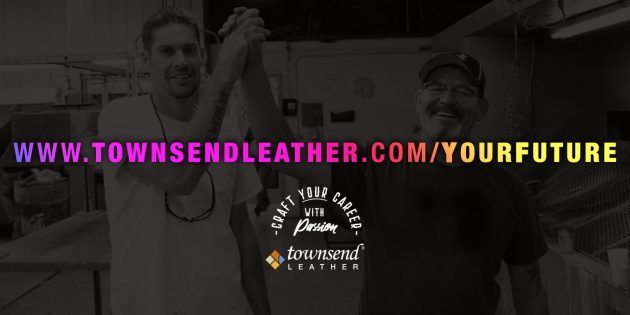 to discuss any opportunities and to learn more about how you may be a fit for Townsend Leather. Our state-of-the-art factory of 110,000 SF is located in upstate New York, about 50 miles NW of Albany. 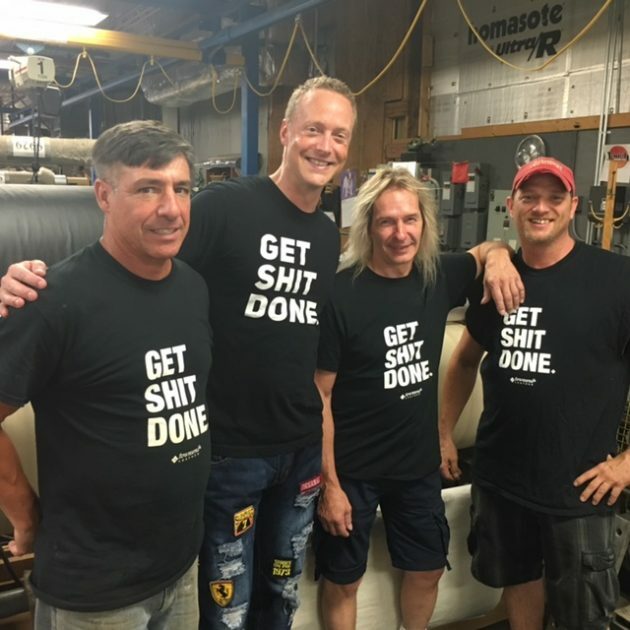 Consisting of 150 employees we produce all our own leather to exact specifications, and take great pride in our level of workmanship, quality control and customer service. 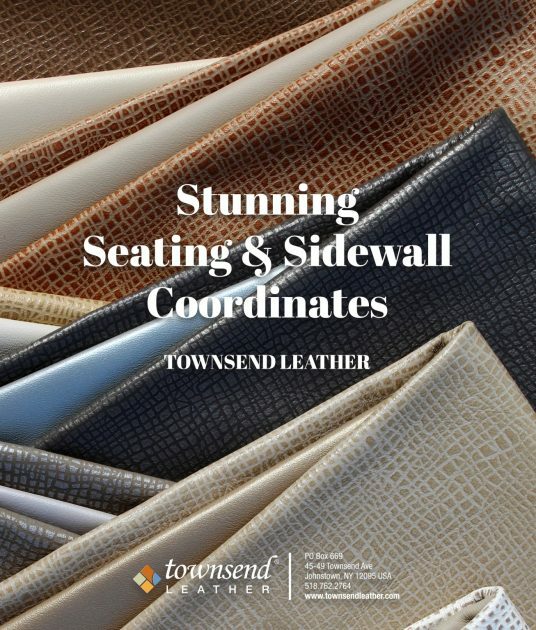 Townsend Leather is the premier source for finest quality upholstery leather for luxury markets the world over. 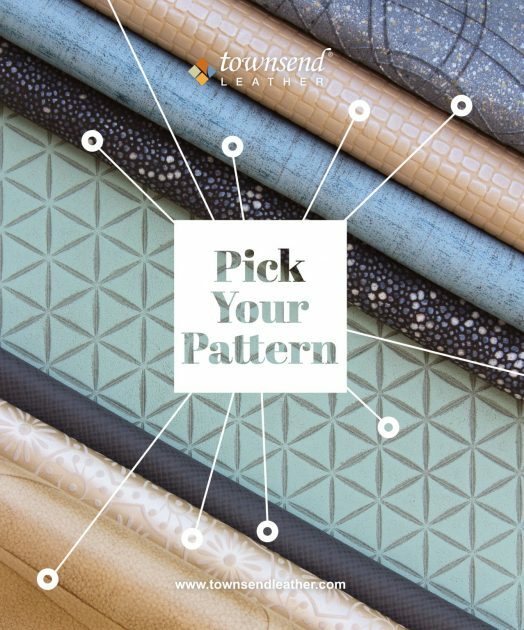 Townsend’s offering of new and unique leathers are driving the standards in luxury interior designs in business, commercial, and VIP aircraft, in yachts, automobiles and motorcoaches, and for residential, contract, and hospitality applications. The future is what you make it. You can shape your future and your story the way you want to. 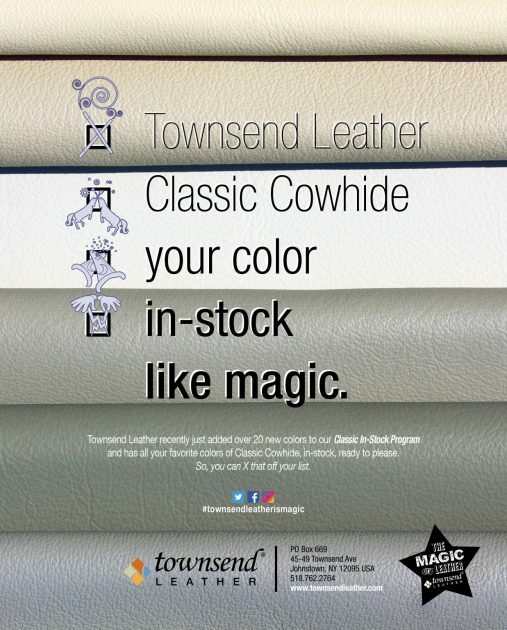 do it with Townsend Leather. 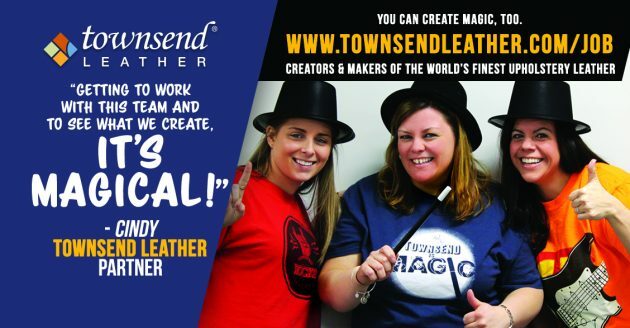 “Top Work Place” and “Best Places To Work” winning, Townsend Leather, is currently hiring awesome people. 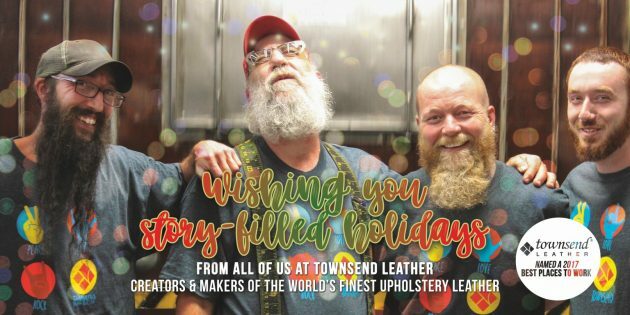 At Townsend Leather you are part of a unique culture of excellence. We don’t hire for specific positions, but rather hire awesome people and train them for a variety of responsibilities along the way. Every employee has a growth path of their own design, with new roles responsibilities, and opportunities arriving all the time. With support all along the way, through training inside and outside of Townsend, through team-focused culture, through travel opportunities, health care, dental care, cultural experiences, in-house on-site Yoga classes, wellness events, values-based awards, fun t-shirts, small group events, and company-wide fun times… growth and time at Townsend is not just skill focused, it is focused on the whole person. 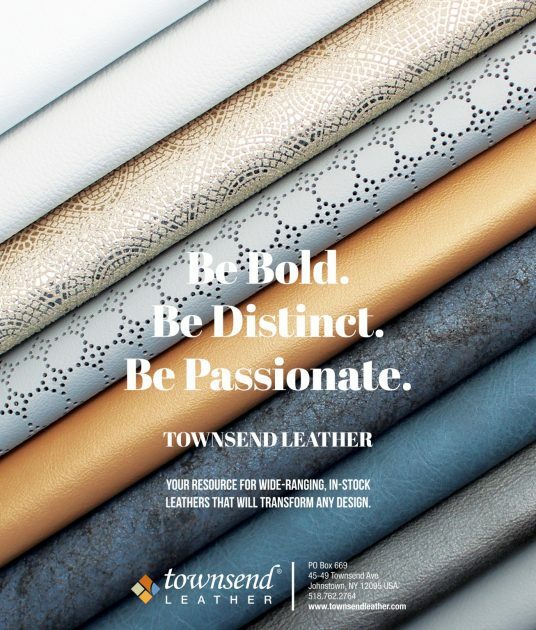 Townsend Leather is full of Partners that are full of passion. We take pride in our work, in our team, in our craft. 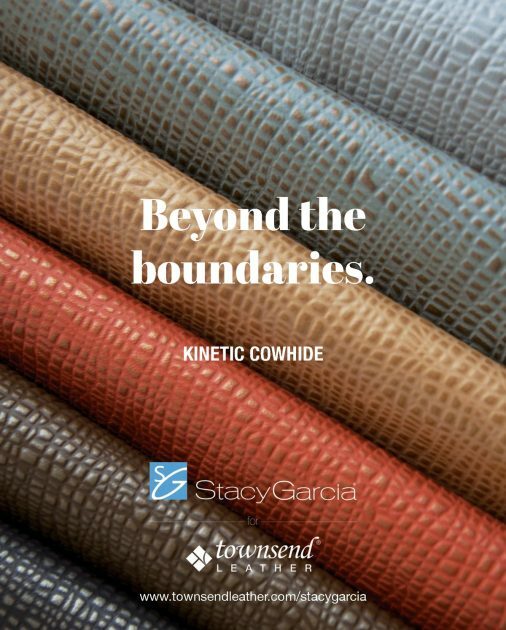 We are the creators and makers of the world’s finest upholstery leather. 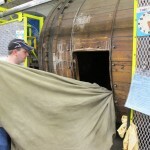 Join us and have your hand in and on the finest leather in the world, that travels across the world. Taking leather hides then sorting, dyeing, coloring, fine tuning, designing, enhancing, and beautifying them with the highest level of artistry and craft, turning them into leather for seats literally fit for a king. 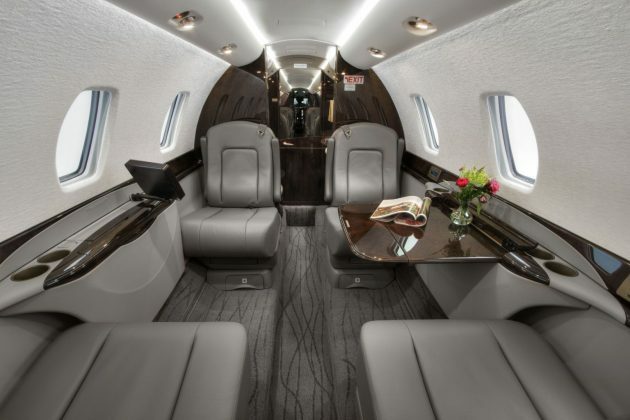 Our leather is all over the planet, in the highest end luxury hotels, to the celebrity private jets that fly to those hotels, to bands posh tour buses, and the dressing rooms of the stages they are headed to. We do it all and do it best. Not only is our product the best in the world, but the team that makes it is the best. And continues to win awards proving so! 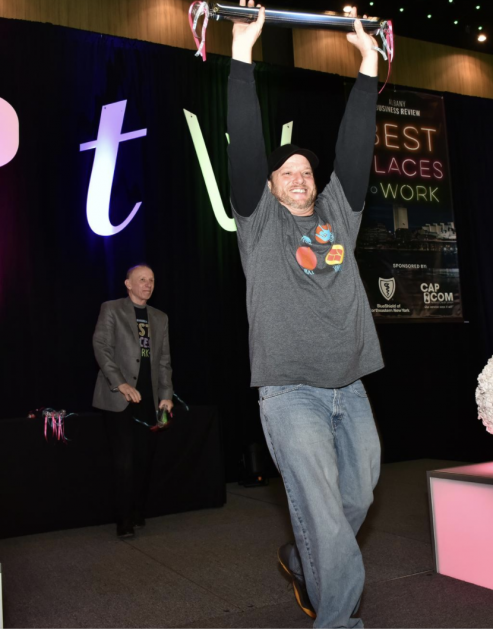 Townsend Leather has been recognized as a Top Place To Work and a Best Place To Work for four years in a row!